Acornbud asked if there were any Kevin Bacon sightings. Yes indeed. I caught this quick pic as he was headed back upstairs after lunch and in full make-up no less. We received advance notice and were waiting for him to come downstairs as the cast and crew headed to lunch. He had passed us when we realized that he was made up to look like a patient so when they returned from lunch I was ready. Too bad I didn't realize that I had zoomed in too much. It's been busy around work. For the past 2 days I've had a gazillion watt light shining in my office window. Even with the blinds closed it's been warm. Thank goodness it has cooled down. They were supposed to go to another site on the campus but due to the rain all today one of my co-workers was told that they would be back tomorrow. 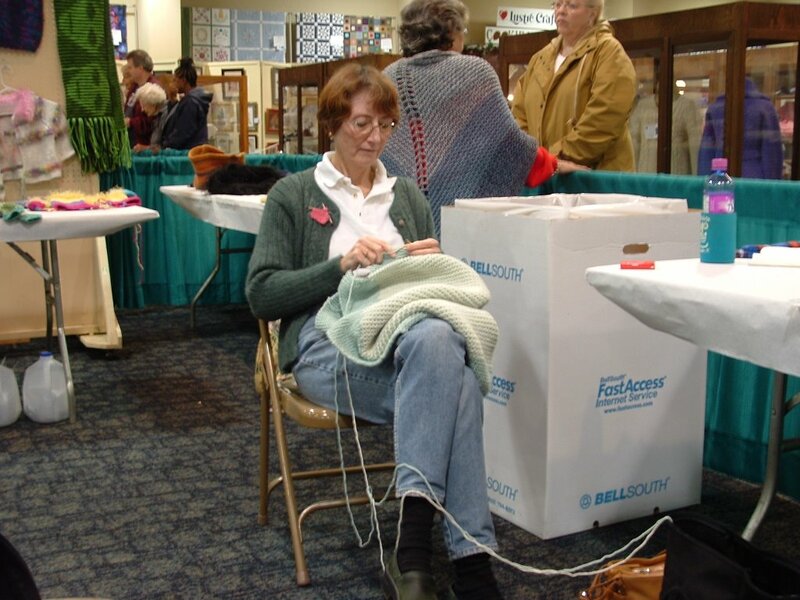 Yesterday the Palmetto Purlers did a knitting demonstration at the State Fair. Charlotte is working on her double knit baby blanket. We have a demo day at the fair each year and bring materials for anyone interested in giving knitting a try. It was fun as always and of course I had to get some of that super healthy fair food. The corn dog was yummy, the fried mushrooms tasty and the Nedderfield's lemonade refreshing. I had an Italian beef sandwch to go. It wasn't as good as the other food, but the Polish sausage that I bought from the same place was delicious this afternoon. The holiday munching has begun a few weeks early. We are in the process of moving out of the house and into the addition for some renovations. It has not been fun and my knitting time has been sacrificed. I've managed to make it to the first Lily of the Valley section by working on the Swallowtail during breaks and lunch at work. I'm downsizing as I go, except for the knitting goods, and should be finished by Thursday. Even though we're not physically moving out, there is a lot of packing and storage involved in clearing out. This weekend I'm headed to the beach to put my feet up, knit and relax. I haven't been anywhere since Las Vegas in April so this trip is long overdue. Aah, there he is. Thanks! What's the name of the film Bacon is shooting? Hey! I happened upon your blog since I joined southern knitters. 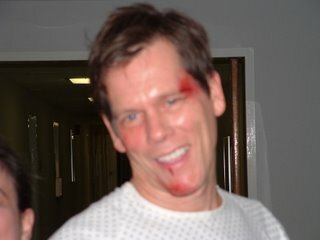 LOL, I was wondering just exactly what was up with Kevin Bacon and his red face, LOL! Gotta love the south, they do love to use our locale for movies! I like KB. I've liked him since way back in the day when Footloose came out. Lucky you to get to see him up close and personal! Enjoy the beach. The moving/house stuff sounds stressful, so hopefully some sand, sea, and salty air will be a perfect cure. Uuih! Kevin Bacon! I like him as an actor, wonder what he's like in real life. The double knit baby blanket looks nice. That's one thing I haven't done yet.